I just had to share this picture of a little garden friend of mine. It is just that I don’t know his name, and wouldn’t know how to ask. My garden is in good health, productive, and free of commercial pesticides. So much so that I had a good look around plot 1 and the compost bin – and there he was, enjoying his dinner. And before too long there was another garden spider waiting for a feed. I’m not sure if spiders like coffee grounds or hate it, so it will need to be settled with some observation. Maybe I will feed some to him (or her), and see what happens. I like gardening with coffee, do spiders garden? Then I took the time to look around and see who else was around… a ladybug, ants, little things flying all around. Lovely! I moved a box of leafmould and under it was a family of Slaters, just like these ones. And of course, the bees, so essential to our lives. It is delightful to watch them go about their business. This is one the sunflowers in my garden, kept healthy by coffee compost. Using coffee grounds seems to assist in creating ideal conditions for beneficial insects to want to stay. Now there has been some suggestion that the pH levels from coffee grounds will kill all your insects, but there has been no observable case of this happening to me – ever. I encourage you to spend some time out in the garden, sit down somewhere in the shade, and try to do as little as possible! Tags: coffee grounds, compost, garden, gardening, Insects, Leaf mold, Slater, soil, spider. Bookmark the permalink. What happens if I kill a spider? Well mate, that might depend on how you look at it. If you are into Karma, then killing a spider on purpose could cause you a few issues down the track, particularly if you then come back as a spider and if you did I would hope it is a nice friendly one like a daddy long legs. 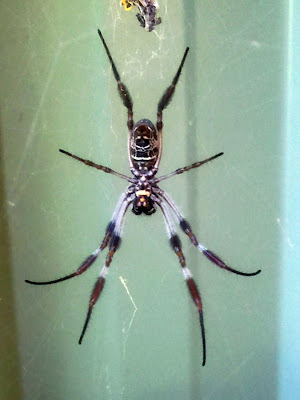 As a garden predator, spiders are effective at insect control and have seen first hand how a healthy spider population keeps down blow fly and mosquito populations. And the last thing about killing a spider is that it would hurt it! Garden spiders! Yuck!! Would be good if coffee grounds killed insects like those, or whatever spiders are. No yuck Jeff! Our little arachnid friends trap and eat many of the bugs that would otherwise degrade the performance of our gardens. They seem to like the garden marigolds, which are a very important plant in the organic garden. Just dug in my first coffee grounds in a large planter pot on the back deck. Linked over to your sight yesterday while reading an article on (what? ), I can’t even remember. Great site and wish you all the luck! People like you DO make a difference. Good goin’ mate! Hope to see you back on the site. Until then be well. Hi Greg, let me see if I can answer that for you. It has not been my experience that coffee grounds will get rid of your aphid problem. Having tried to get rid of aphids like everyone else, I tried coffee grounds in the soil and dissolved in water and then sprayed on them, for little to no effect. In fact I think just spraying them off the plant with water is the most effective way to get rid of them. Also tried chilli powder and garlic in water and that didn’t seem to do any better than just spraying them off with water. Cheers Penny. My garden is much improved for following organic methods, including coffee grounds of course. Now there might be more spiders lurking around but they are a part of this little ecosystem after all, and help maintain balance as a top level garden predator.